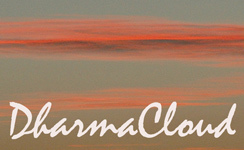 DharmaCloud started in 1995 after a series of introductory meditation courses. In the first two years it was called the Cloudroom Dharma Group. There were monthly group meetings on the first Wednesday of the month between July 1995 and December 2005. There was a smaller group for experienced practitioners called the Heartwood Group which was a subgroup of DharmaCloud and met regularly from April 2004 to February 2008. All these meeings took place at the Cloudroom at the Morningside Healing Sanctuary. There were both residential and non-residential retreats and workshops.